After two weeks north of Austin in the same little RV park….with almost daily trips SOMEwhere….we were looking for a peaceful, restful, change. 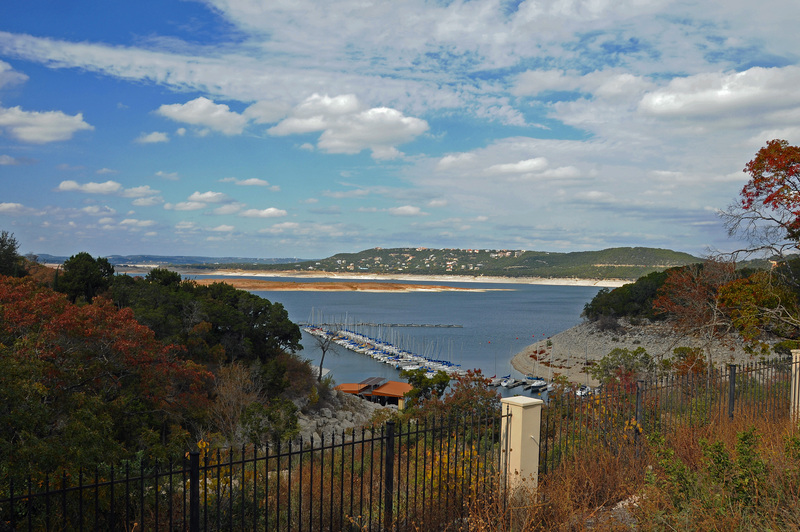 A federal campground on Canyon Lake, between Austin and San Antonio, west of I-35 in the midst of hill country, half the sites closed for the winter (winter? it was 75 today!) and half the remaining sites empty…..
We rested up today, to prepare for a monster run into San Antonio tomorrow. Good grief, we plan to cover the second largest city in Texas in one day! (Seventh largest in the nation.) Not really, but we’ll see what we can see, eat something, shoot some photos (supposed to be overcast, though), walk some and gaze in wide wonder, and drive home in the dark. More time for San Antone next year. We sure appreciate your observations and suggestions! 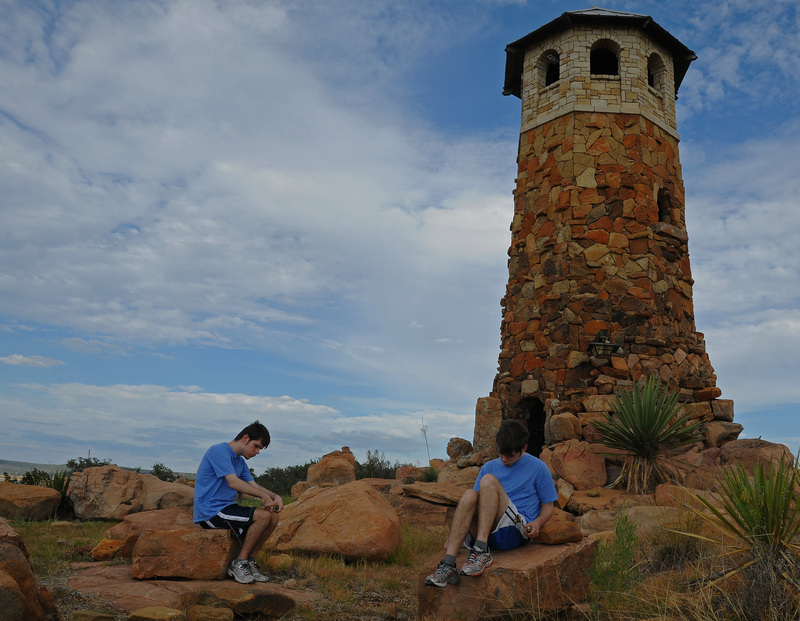 A very faithful follower of the blog and frequent commenter….and friend to both of us from looong ago in high school….Judi Doty, observed that we were parked just outside Round Rock, Texas, and noted a couple points about its history. Turns out the town’s main history is located a literal stone’s throw from I-35 along a stretch we had already traveled a dozen times! It’s namesake, a large round rock, sits in a river at a point where early settlers, cattle drovers, and other travelers found a good place to cross at low water. The rock was such a distinctive marker for such an important purpose, that it became the focal point of local history. Jesse Chisholm was a cattle drover who established a commonly used trail (the Chisholm Trail) from south Texas to the cattle yards in Abilene, Kansas that used this crossing. So many wagons used this site that their wheels carved ruts in the stone leading to the water! 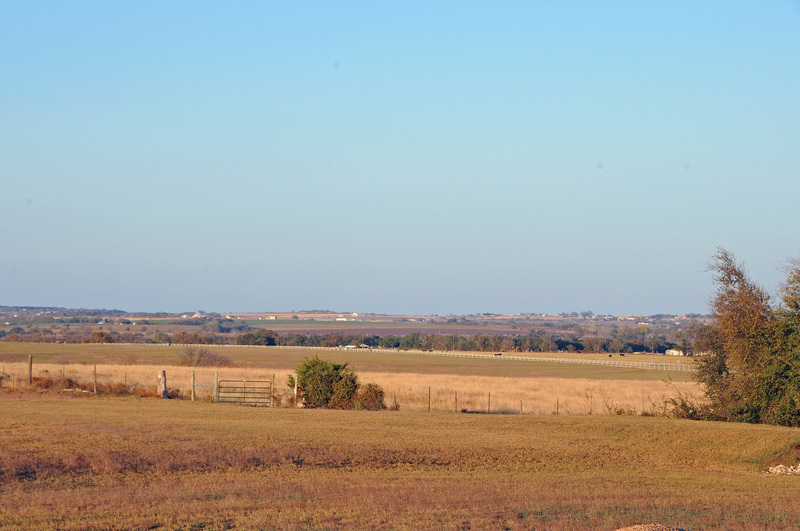 We toured out into the Texas heartland to visit the LBJ Ranch. Lyndon Johnson was an interesting president. The contrast of his method of operation (domineering, crush the powerful opposition) with that of his charistmatic predecessor, JFK. The striking difference between his strong support for education (he championed the formation of Head Start) and his powerful and effective efforts to increase the US involvement in Vietnam. He also was proud of his heritage as a Texan. He lived on the property where he was born, christened it the Texas Whitehouse and thereby became the first President to use his residence as a functioning White House away from Washington, and is buried on the property. The grass airstrip on the property was upgraded when he became President so it could handle small jets, which enabled him to spend nearly 25% of his days in office at the property. Today, the property includes an operating ranch, a living history farm, pastures for American bison, Texas Longhorn cattle, antelope, and deer, LBJ’s childhood school house, the homes of several relatives, and the family cemetery. They are all contained in a joint state park and national historical park. We had also been told that a small town 15 miles beyond the ranch would be worth a visit. A dear friend from 8th grade (isn’t Facebook amazing?) 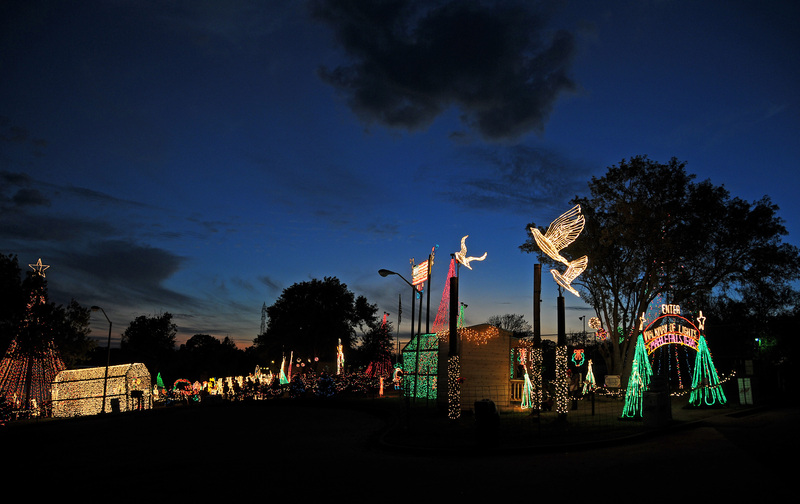 said Fredericksburg, settled by German immigrants, could provide some good food and fun Christmas lights. Right you were, Brenda! A bakery that has been continuously operating since 1917 (fabulous apple strudel). Food to die for around the corner, eaten on the patio due to the 76 degree evening. A final highlight in town: Christmas lights in the square that included a pyramid with carousels on multiple levels. This one was carved and built in Germany, and brought here. Very distinctive. On our way home in the darkness, we came through Johnson City where the county electric company has its headquarters. The same company whose branch office featured the incredibly lighted tree we showed you a week ago. Ahhh, but this was the headquarters…. We’ve been parked for nearly two weeks on the eastern edge of Georgetown, TX. It seems to be the upper and eastern edge of the hill country. Our view out the front window of the coach is pointed almost perfectly away from the hills….but it serves to remind us that this state is BIG and with its dry air you can see for MILES. No traveling today, we rested up from last night’s big adventure (guess who got home after 2am?)!! We expect to visit LBJ State Park tomorrow. History, longhorn cattle, and bison. And after dark on the way home, a million lights in the trees…. This is a great country. 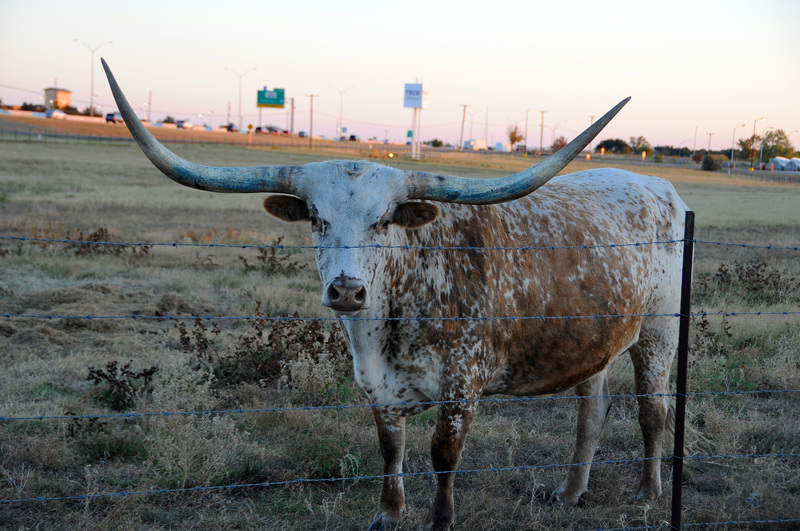 We’ve been looking for Texas Longhorn cattle since we crossed the border. Who knew the first one we saw would be pastured alongside the interstate in the front yard of the TECO-Westinghouse world headquarters! The breed is said to be noteworthy for its gentle disposition. If so, this one was having a really bad day, because he came charging at the fence when I walked up! I’m grateful he was unaware how easily he could have taken down the fence and really made me move. We had fun connecting with some dear friends from Robyn’s distant past, and she is attending a concert tonight where their daughter will perform. It’ll be guys night at the coach. If we’re all lucky, the boys will sleep! What a great part of this great state of Texas! Check out the first two photos: the hillsides that surround the lake, dotted with houses….some of the houses are pretty substantial, and they display obvious personalities. 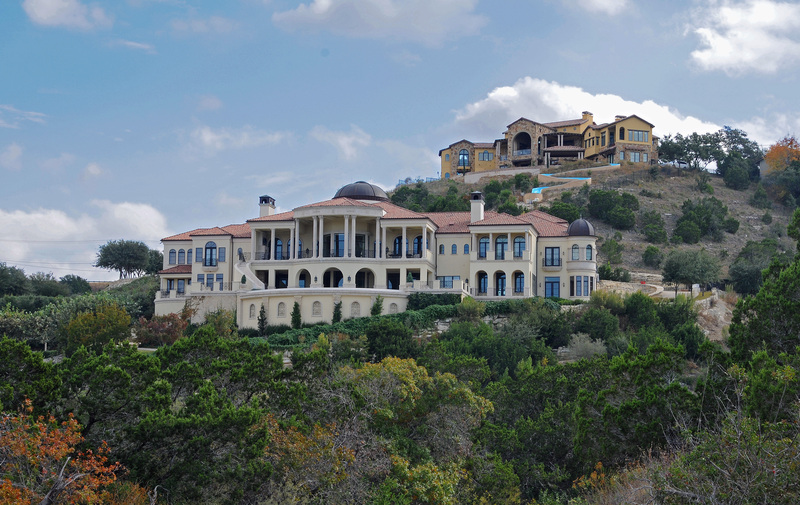 Notice the water slide down the hillside from the top house? This lake was downstream on the Colorado River from the two lakes we visited yesterday. We were told this one has simply been suffering from too little rainfall over the past several years. We saw numerous marinas, restaurants, bed & breakfasts, and even a city park, all closed because close proximity to the water’s edge was their claim to fame. We finished our tour with a swing through downtown Austin. 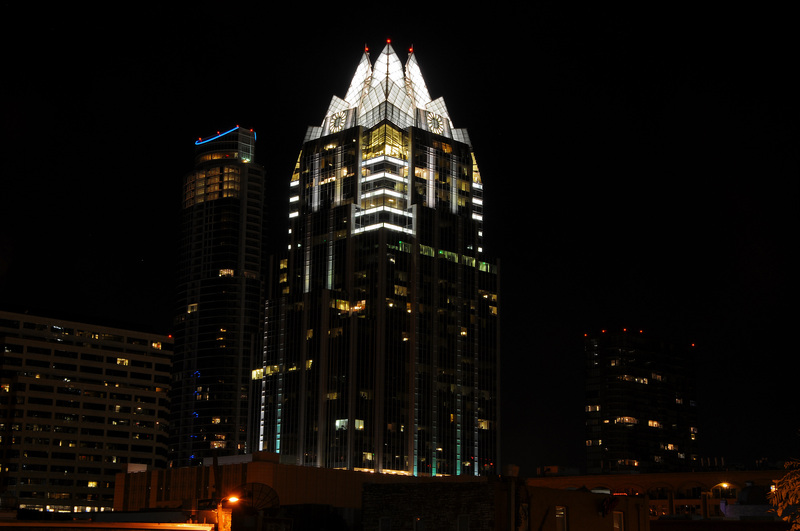 The structure and lighting of the Frost Bank Tower caught our attention. However, the city is designed to focus attention on the Texas State Capitol building, and we spent most of our time there. It was constructed in 1888, and was the seventh-largest building in the world at that time. 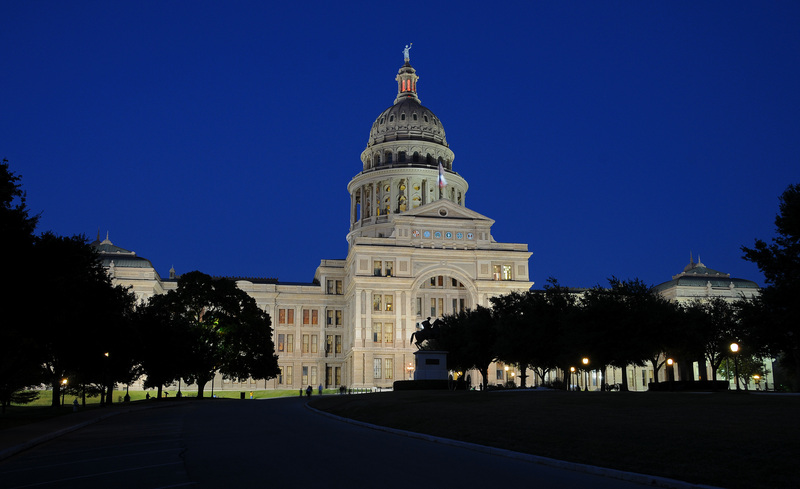 In 2008, a poll of American Institute of Architects members ranked it the number one state capitol. The boys really don’t interact with their environment much beyond the walking surface! On the other hand, they are more peaceful and cooperative with us in the coach and outside when the environment is quiet and the sounds are simple. But we occasionally take them to music concerts, and they seem to enjoy the sound and vibrations of even extremely loud music….if we bring them in gradually. Ross has a dance he will perform on his own for 20 minutes if he really gets into the music! Ross and Ryan demonstrate real contentment and sometimes real joy about being in the small environment of the coach. They are much less comfortable in a space that they must traverse in order to touch the other side. They each have a sofa in the coach, and the sofa is a very important part of their stability and security when parked and when traveling. Traveling in the coach provides Robyn and me with pleasure due to the variety. Living in the coach provides Ross and Ryan with pleasure and comfort due to the familiarity. 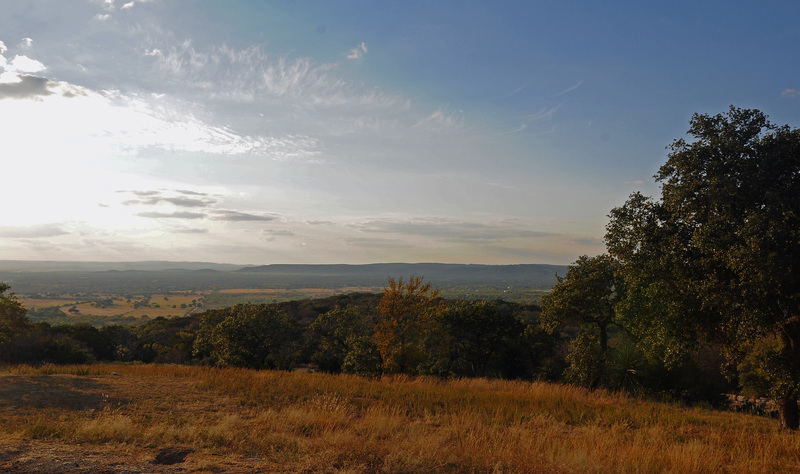 We’ve been hearing stuff about the Texas hill country around Austin since we first mentioned coming here. We finally did a loop today to the west of Georgetown, TX. 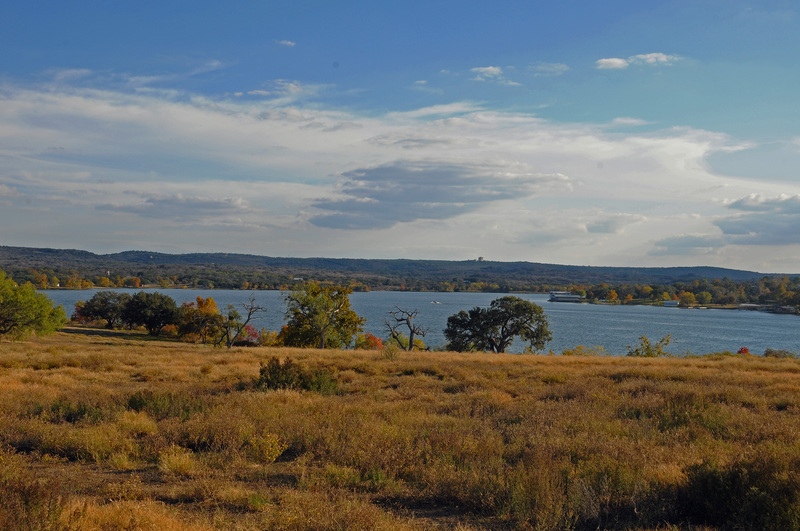 Covered about 150 miles over to Buchanan Lake and Inks Lake, and down to the town of Marble Falls. The introductory miles into Texas are mostly impressive for their vastness….the road rolls and rolls, you’ve covered 100 miles, and you’ve got another 100 to go. When you arrive, it looks the same as when you first hit the border! And you’ve got hundreds more you can travel in any direction! Ahh, but the temp today was 75 degrees, the humidity was low (but you’ll notice a slight haze in some photos and plenty of clouds, so humidity was up a bit), there was a slight breeze, and you just wanted to BREATHE the air! And hill country finally brings some immediacy to the horizon! Yessir, there were some real humps and dips in the road, and sharp curves as it climbed the hillside. 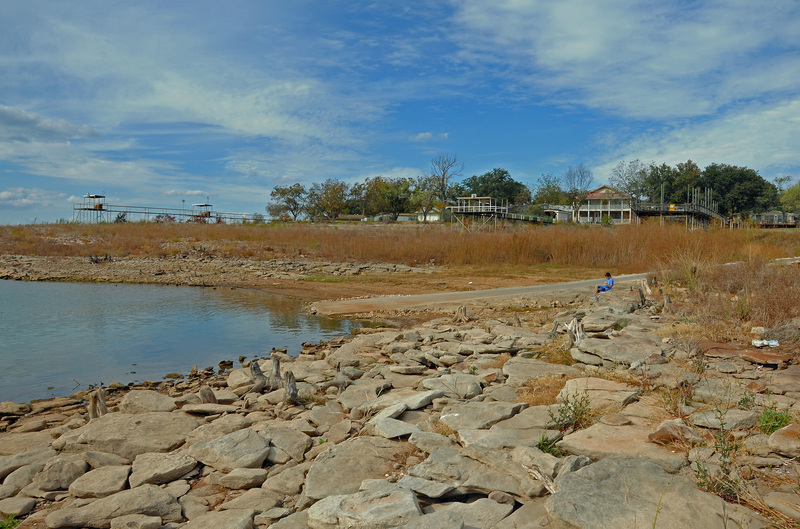 The second photo today is Inks Lake; it appears to provide loads of fun for the residents whose homes surround it and the campers who fill the state park beside it. And it’s nice for photos. Although it is quite small, the lake was filled to the brim. That’s interesting, because it is fed by Buchanan Lake, which is much, much larger. And very nearly dry. The photo of water just barely reaching the boat launch, and backyard docks jutting into thin air (and Ross sitting on a rock that should be 15 feet under water): that’s Buchanan Lake. Apparently it has a key point or two where sediment has accumulated so much that it blocks the Colorado River from completely filling the lake! One victim of the disappearing lake was a fabulous residential development on a peninsula that pokes way out into the lake. The lighthouse where Ross and Ryan sit was near the end of land, with over 40 lots all marked and ready for building. There were three houses built but only one is occupied. We had to tear ourselves away from the beautiful countryside as dusk fell. We routed ourselves through Marble Falls to get home, because we heard they had lit an extensive display of holiday lights last weekend. Righto! Ross and Ryan enjoyed the Christmas music as Robyn walked the complete path through the lovely display. 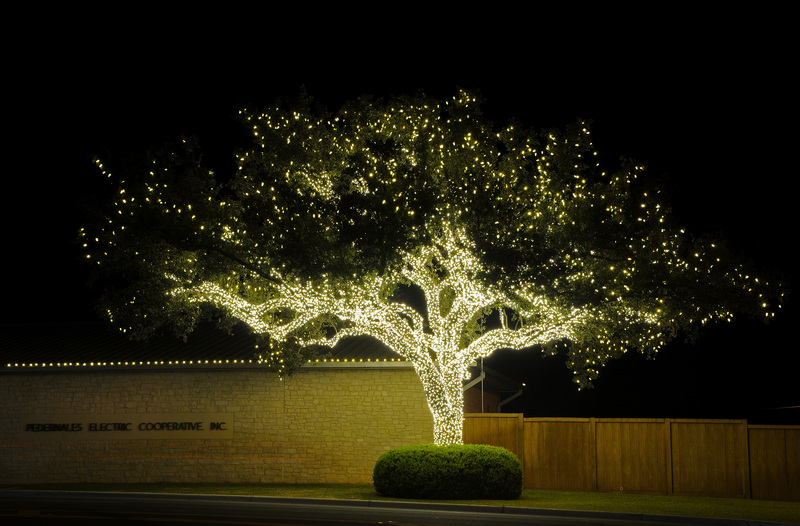 As we passed through another small town, we just had to stop and admire an amazing display of lights around this very large tree. It really was stunning! Notice the name of the company where it’s located?